Don't let quinoa remain a sorry side dish at family get-togethers. Instead, make it the main attraction at your next meal! There's a lot to love about quinoa. It's a complete protein (meaning it contains all essential amino acids, like animal protein does), and it's rich in vitamins, minerals, and antioxidants. Take into account its versatility and its nutty taste as well, and you'd be foolish not to make quinoa a starring role on your plate. If you're a quinoa virgin or have only been using it as a plain-Jane side dish, try these three tasty ways to make quinoa the main attraction at your next meal! This dish will "bowl" you over with great flavors, textures, and a healthy balance of macronutrients. Plus, by serving everything in a bowl, all the ingredients are deliciously mixed together instead of getting pushed around on a plate. The quinoa, salmon, and mango sauce can be prepared ahead of time and kept chilled separately for up to 3 days. A bowl of chicken soup will always comfort the soul, but this version packs extra nutrition and health benefits. 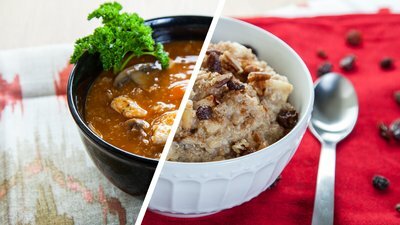 Quinoa makes for a healthier alternative to processed noodles, while chicken thighs provide a juicy, flavorful source of protein to feed your muscles. Whip up a bigger batch, and stash individual portions in the freezer. Quinoa and hearty steel-cut oats team up to raise the ante on breakfast oatmeal. Apple and warming spices make it taste extra comforting. By soaking the grains overnight, the cooking time in the morning is significantly shortened. For extra protein, you can stir in some protein powder or serve it alongside your favorite omelet.